What’s for dinner? That seemingly innocuous question from one of my children has, on more than one occasion, been the pre-cursor to a dinner-time tantrum. And by tantrum, I am talking about hair-raising melt-downs. Parents, you can relate…right? All this, usually because my response to the said question fell short of the expectations of a 4-year old or his sister’s. You see, I am blessed with not one, but two fussy eaters. And in a bid to take back some control at the dinner table, one of the skills I am learning to master is how to navigate the qualifying question of “what’s for dinner?” asked by one or both of my fussy eaters in a way that makes them look actually forward to dinner. Lately, judging by the excitable squeals of delight from my fussy two in response to the dreaded “what’s for dinner?” question, I can safely conclude that my mastery is complete… And that I have finally learned the subtle art of selling to 4-year olds. that it has nothing to do with mastery and everything to do with mangoes… And that, I fear, is the truth. I have learnt that I can’t go wrong with mangoes when it comes to my 4-year old. I can’t go wrong with dessert (that isn’t sweet) dressed up as dinner. 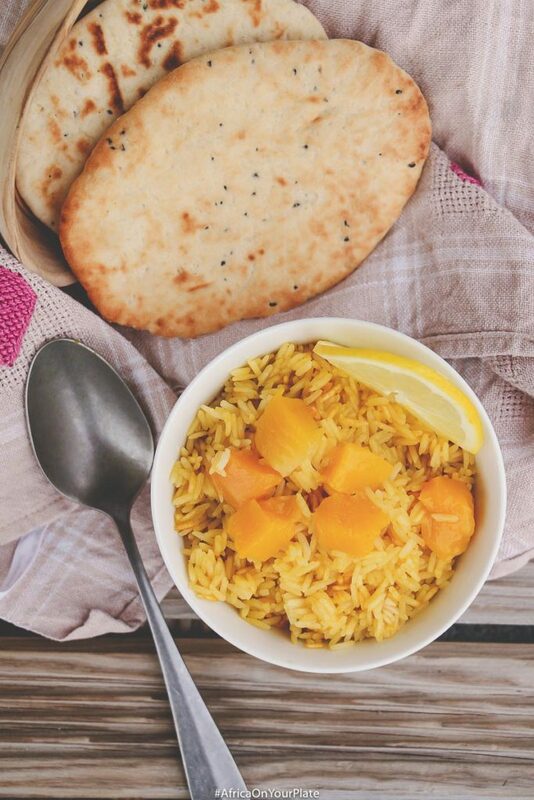 I can’t go wrong with this Coconut Mango rice recipe. 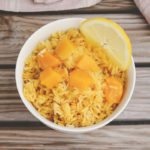 This Kenyan Coconut Mango rice has saved the day one too many times but it is not revolutionary: It is Kenyan wali wa nazi – jasmine rice, cooked in coconut milk – with the addition of mango puree. 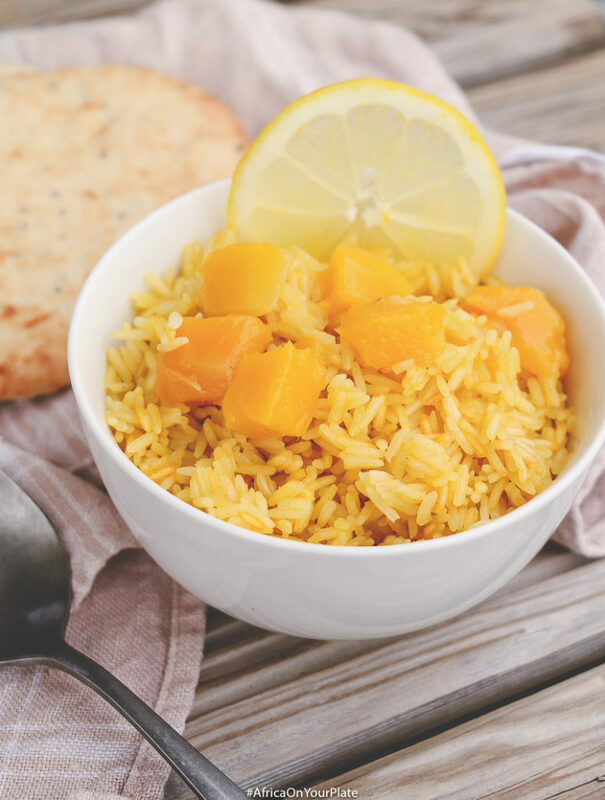 It is a refreshing rice bowl packed with flavour; Savoury yet sweet, with a hint of tang from the mango. Creamy in texture from the coconut milk, with the rice cooked to crisp and fluffy perfection. And, it is tasty. And approved of by all generations. What’s more – this is one dish that you can make without even having to think too much about how to make it. This is the sort of dish for which a recipe is superfluous – the idea is the recipe. Take an equal part of mango puree, and coconut milk. Add some vegetable stock and cook your rice till soft. Job done! As a parent, I occasionally have surges of profound gratitude for certain foods. For example, bananas. How would we have made it as a specie without bananas? How do people raise children without bananas? I feel the same about mangoes. And although I have always loved mangoes, I love them especially more these days. When you take into account that my fussy eaters will eat anything that contains even a hint of mangoes. And so, while my children may never take up silent meditation (of which I am still hopeful), I remain grateful to the humble mango for delivering a healthy and fuss-free dinner-time, every-time! 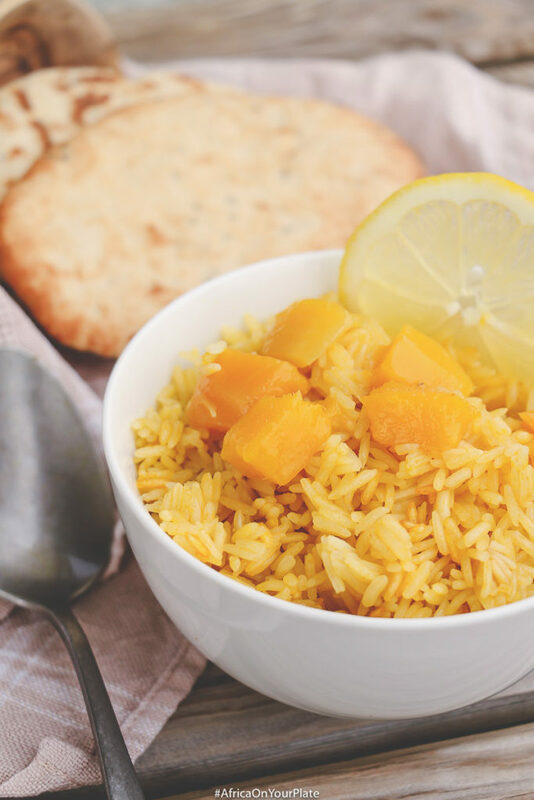 This Kenyan-inspired coconut mango rice inspired by Wali Wa Nazi (Kenyan Coconut Rice) combines the sweet and tangy flavours of mangoes with the creamy texture of coconut into one easy-to-make and delicious meal. Rinse the rice in a few changes of cold water, until the water runs clear. Drain well and set aside. Add the coconut milk, mango puree and vegetable stock into a large saucepan with a tight-fitting lid. Bring to a boil. Pour the drained rice into the boiling liquid. Stir once, just enough to separate the rice. Cover the pot tightly and simmer on low heat for about 18 minutes. Remove from heat and allow the rice to steam in the pot covered for another 5 - 7 minutes. Is this recipe right for me? “This is the sort of dish for which a recipe is superfluous – the idea is the recipe.” – I think the best dishes one enjoy cooking for joy has no recipe and comes as your cooking it. Some of this and a little of dat kinda cooking. “Take an equal part of mango puree, and coconut milk. Add some vegetable stock and cook your rice till soft. Job done!” – That’s all I really need to know, the idea of it and my mind will try and figure it out. I think outside of baking really, only mostly in the western world that people get hang up on a exact recipe. Absolutely luv that rice though! And another way to jazz up some rice into Flavortown. Rice need not ever be boring and as it’s a canvas to pain and layer flavors onto. Yeah, that’s two ingredients that I absolutely luv, Mangoes and Coconut. 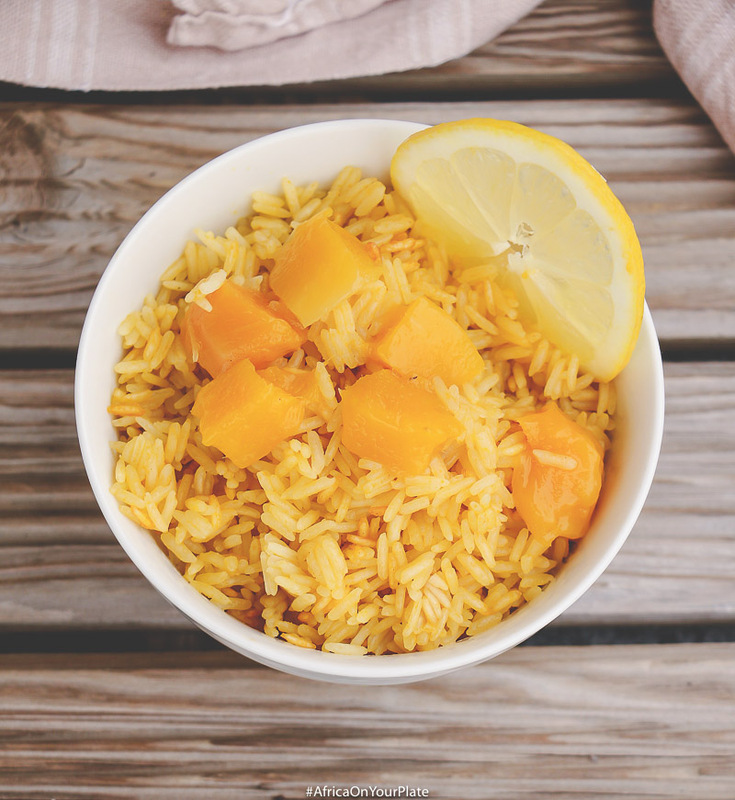 I would think you can do that with a ripe Papaya as well as that’s some good tropical flavor too and gives some rich color to the rice as well. There’s another idea for you. Think I’ll cook that next time I cook and made rice as I have a few mangoes at home.